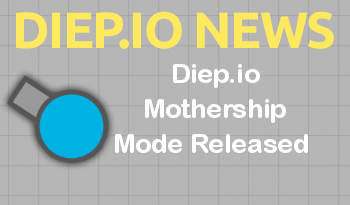 [TAB] is keyword for entering Mothership mode as you can seen in diep.io main webpage. Red “diep.io“ tanks Vs Blue “diep.io“ tanks with mother tank which has very large body and strong health range. Players need to destroy the enemy mothership while keeping theirs alive. In each team, a player gains control of the mothership. Mother tanks move slowly compared tanks of players. Mother tanks have a defensive triangles against enemies.When enemies come up to your mother tank, your mother tank attack to enemies with its triangles. You can not hit your own team players. Your team purpose is killing teams in other color. Tanks should be selected with multi-shot mode such as Triple Twin, Octo Tank or Penta Shot because the mothership mode has small map in the game.In addition, bullet speed and power play a important role in this game.You should be able to kill more people with bullet damage.Movement speed is very important because you will be exposed to a lot of bullets and triangles of mother tank attacking.However, body damage, health regen are not significant advantage compared bullet features.